A preacher should have the mind of a scholar, the heart of a child, and the hide of a rhinoceros. His problem is how to toughen his hide without hardening his heart. 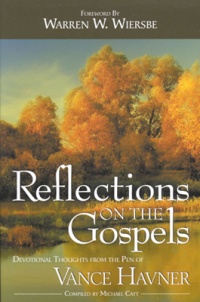 Vance Havner's Reflections on the Gospels is a collection of devotionals that Dr. Havner wrote in the 1920s and 1930s. These were written as individual articles, but never compiled in a book. The book will give you insight into the man, and his respect and love for God and His Word. Dr. Vance Havner was a revivalist. He authored nearly forty books during his ministry. His unique style has impacted thousands of God's people through the years. He is considered by many to be the most quoted preacher of the 20th century. Consider this book your opportunity to spend a minute or two with a New Testament prophet. Billy Graham once said, "I do not know of any man in my generation who has stirred revival fires in the hearts of so many people throughout the nation as has Vance Havner..."
Dr. Havner was known for his one liners that have found there way into thousands of books and sermons. These writings will be an encouragement to pastors, Bible teachers and laymen as they study the Scriptures. Whether you use this book as a personal devotional or as a study tool, you'll find the insights enlightening and inspiring.